The 2014 Best Practices Showcase bring together more than 30 universities from Puerto Rico, United States and Latin America. HETS celebrated its Best Practices Showcase: Celebrating Technology Innovation for Hispanic Success in Higher Education during January 16 and 17, 2014. 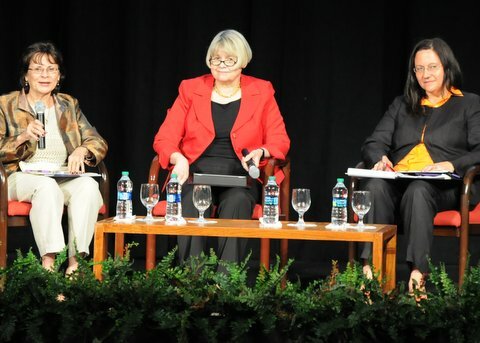 The event was hosted by the Universidad del Sagrado Corazón in San Juan, Puerto Rico. 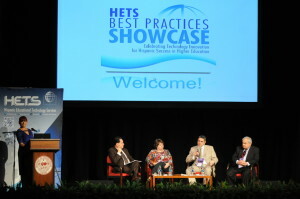 This was the third time that HETS celebrated this important gathering of higher education institutions from Puerto Rico, United States and Latin America to share its best practices and innovative projects for the benefit of the academic community. This year we received more than 30 institutions members and non members of the consortium. 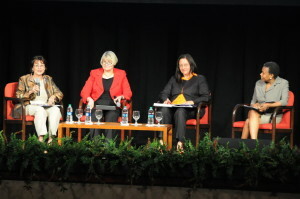 The conference opened with an experts panel composed of: Dr. Alberto Acereda, Sr. Strategic Advisor for Educational Testing Services (ETS); Dr. María Ruíz Cediel, Director of Educational Innovation and Technology, Universidad Cooperativa de Colombia and Dr. Tito Guerrero, III, Vice President, Middle States Commission on Higher Education. This panel shared interesting discussions related to the retention on Hispanic Students, Assessment and Distance Learning. Dr. Nitza Hernández directs to the public during the track winners panel. From left to right: Dr. Hernández, Dr. Jane Delgado, BMCC; Dr. Celia Cruz-Johnnson, SJCC and Dr. Marva Craig, BMCC. In addition, as part of the Conference’s program more than 35 best practices were shared with attendees related to the use of new technologies in the classroom, new tools used to support present and online students, technologies to enhance students’ success, assessment process and integration of social media to the academic atmosphere among others. Please visit Concurrent Sessions to learn more about the best practices shared during the two day conference, get access to the video at Theater and to the copies of the rest of presentations. As part of the event, HETS also celebrated an Academic Fair free of charge on January 16 from 5:00 to 7:30 pm at the Sport Complex of the Universidad del Sagrado Corazón. The academic fair purpose was to help students and professionals learn more about HETS member institutions academic offerings. Among the institutions showcased in this event we can mention: Universidad del Sagrado Corazón, National University College, Ana G. Méndez University System, EDP University, Colegio Universitario de San Juan, Polytechnic University of PR, Pontificia Universidad Católica de PR, Caribbean University, the Inter American University of Puerto Rico, Carlos Albizu University, Huertas College, University of Texas- Pan America, Borough of Manhattan Community College (CUNY), Lehman College (CUNY), Bronx Community College (CUNY), Berkeley College (NY & NJ), Eastern Washington University and the Universidad Cooperativa de Colombia. HETS would like to recognize the valuable collaboration of the USC, President, Dr. José Jaime Rivera, the Office of Public Relations, headed by Dr. Maria Eugenia Madrid and its staff who made possible the success of this event. Please visit the event page to access copy of the presentations and the links to the best practices showcased at the Universidad del Sagrado Corazón Theater during the event. For more information about this event you can also contact our office at 787-766-2600 extensions 8910 y 8911.